From Buenos Aires we caught a ferry into Uruguay. We had to go through full airport style check-in and security, with bag scanners and personal scanners too! Luckily the boat ride was only an hour, not being great on any boat I am always a bit nervous when the weather isn’t great. The journey only got a bit rough in the last ten minutes so I managed OK. So I’m now in country six of seven! 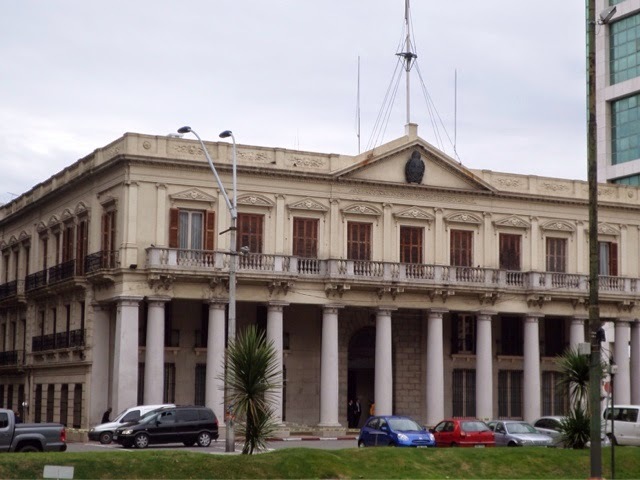 Uruguay’s full name is the Oriental Republic of Uruguay and it has a population of 3.4 million as of 2012, with almost half living in the capital. The main exports here are meat, rice, leather and cars. Uruguay is more affluent than other South American countries and is also pioneering in its social policy. It was the first South American nation to establish a welfare state back in 1902, the first to legalise divorce and they legalised abortion in 2012 and gay marriage in 2013. That’s very progressive compared to most countries over here. It’s also known to be far less corrupt then other South American countries. Relatively high taxes have resulted in a higher level quality of life and Uruguay has been dubbed the Switzerland of South America. Between 1970-1985 the country went through a repressive military dictatorship, which was very bloody. Work is still being done now to locate disappeared persons, or their remains. Uruguay has a strained relationship with Argentina, as Uruguay has paper mills along the Rio de la Plata, which Argentina claims are polluting the water and damaging the river’s ecosystems. From the views along the way on my bus journeys the country seems mainly to be rural, most of the landscape is livestock farms, with small towns scattered around. 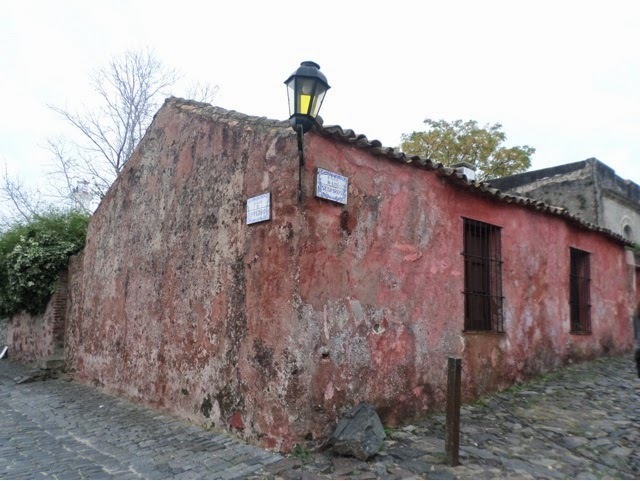 Our ferry took us into the town of Colonia, which has the full name of Colonia del Sacramento and it is the oldest town in Uruguay. 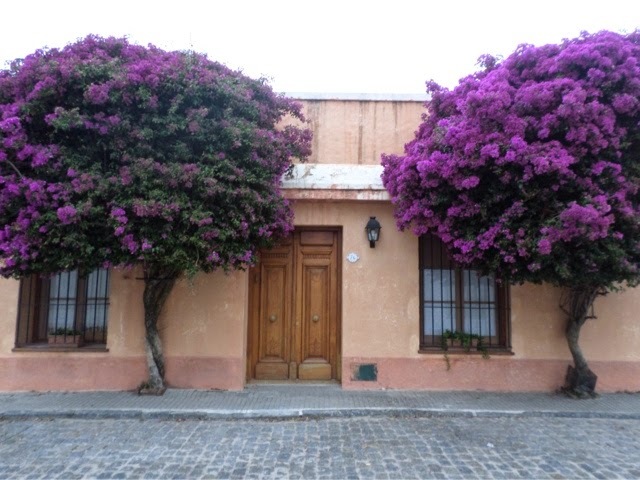 It is also world heritage listed by UNESCO in the area of the old town, located down by the river called Barrio Historico. 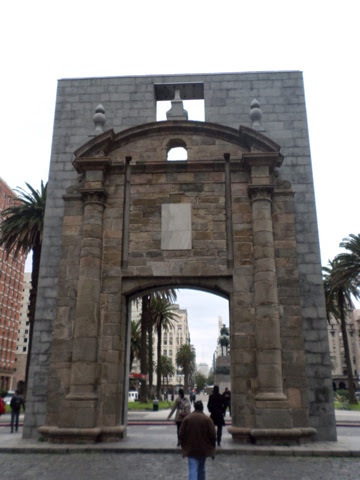 It’s the only heritage listed site in Uruguay. 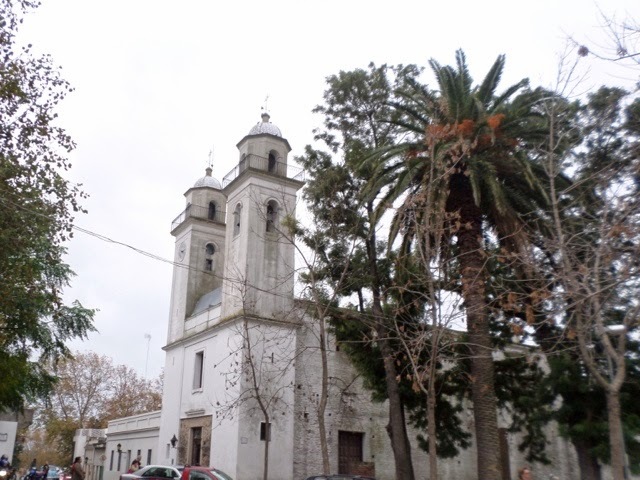 The town is on a promontory into the Rio de la Plata, so is surrounded by river on three sides, which seems huge. 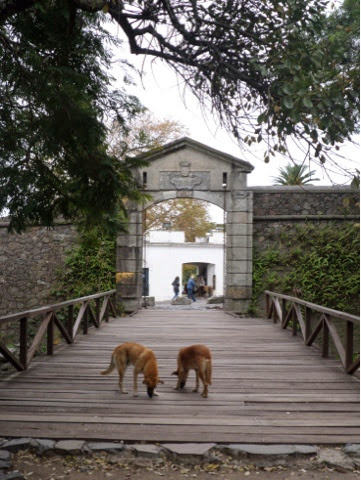 The town was settled by the Portuguese, from Brazil in 1680, so it has a different layout to other colonial towns here that are based on the Spanish system. 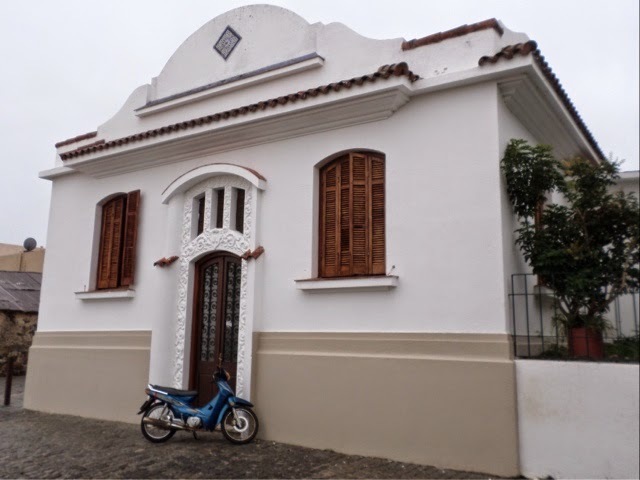 The town actually has an interesting mix of Portuguese and Spanish architecture. Firstly the design of the street drainage differs, Portuguese drainage is down the centre of the streets and Spanish streets are convex and drain off to either side. The other difference is with the rooftops; they are flat if Portuguese and pitched if Spanish. At first the town was held by the Portuguese as they settled it, then the Spanish took control, it was then was incorporated into Brazil so it went back to Portugal. It was then part of Brazil that became independent from the west and eventually became independent in itself. There is more to it than that, but I can’t really remember much, as it was cold and rainy so I wasn’t really in a fact absorbing frame of mind, sorry! The town was also originally important in smuggling British goods into the Spanish colonies! We took a walk through the drizzle down to the main square, the Plaza Mayor. The square was originally designed and used for military practice and training. It has since been done up as a public space and is quite charming, there are lots of parakeets in the trees, but there are also a lot of very, very big street dogs, which I don’t like at all. The gate marking the entrance to the old town. There is a dug moat around it. 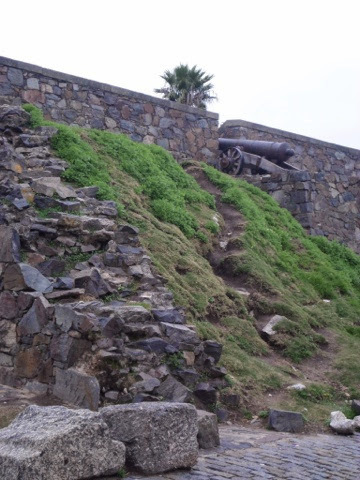 The rear side of the town wall, guarded by cannons. 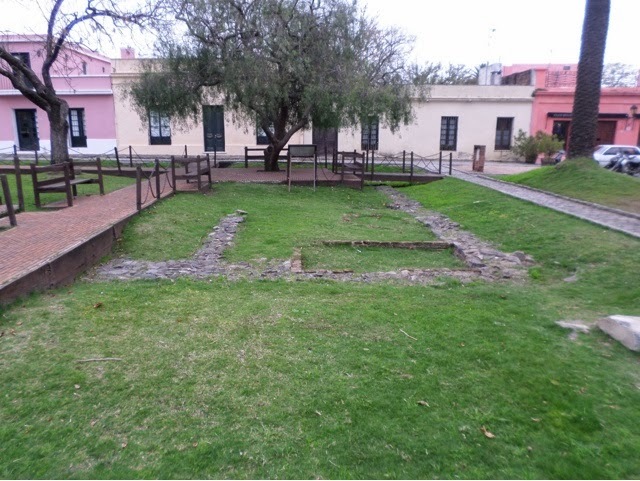 At one end of the square is a lighthouse and ruins of a convent. The convent was built in 1694 but was destroyed by fire in 1704. You can climb the lighthouse but the weather wasn’t clear enough to make it worthwhile. When the weather is very good though you can see all the way over to Buenos Aires. 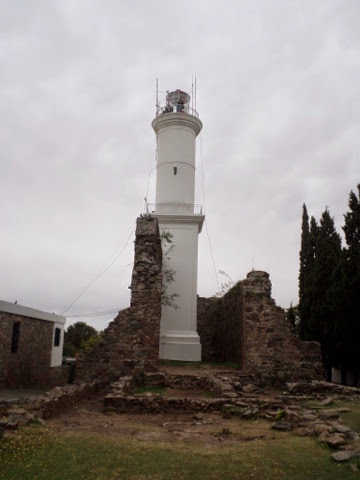 The lighthouse surrounded by the ruins of the convent. We walked along the Calle de los Suspiros, translated as the ‘street of sighs’. It is an old street with its original Portuguese buildings and the drainage is markedly down the centre of the street, with very irregular paving. It’s a very pretty street with a real feeling of faded glamour. The main cathedral was built behind the main square rather than on it, as was the Spanish style. The bedrock is extremely shallow here so buildings are built straight onto the rock. Therefore, for stability of the cathedral the walls are over a metre thick! There are more ruins around the cathedral too and you can still see their foundations. A pretty house, I love the colour of the trees. Most of the houses in the old town are very charming. 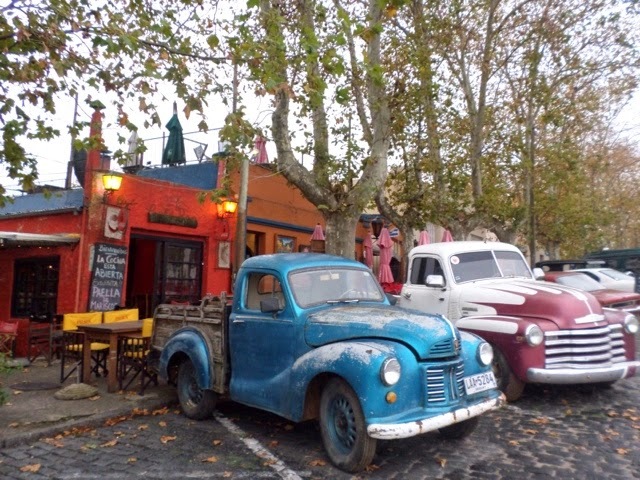 There are lots of cool old cars and trucks around, check these out! I’d love an old 1950s V8 truck. The evening was spent having a pretty average dinner before retreating from the rain again to head to bed. It was a slight shame not to see more of Colonia as it seems like a very pretty town. I only had a single day there and the awful weather just made everything a bit grey and depressing to be honest. I hate the rain, especially when it’s cold and you can’t get dry for ages! 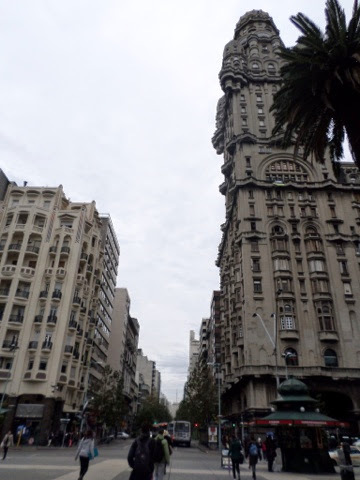 The next day I jumped on another bus and headed to the capital city, Montevideo. Montevideo is far larger than all the other cities in Uruguay and about 1.5 million people live there. It’s quite European looking from the architectectural style of the buildings. We headed out on another rainy orientation walk, as we’re staying on the main street, Avenue 18 de Julio, it was just a short walk to the main square, the Plaza de Indepencia. 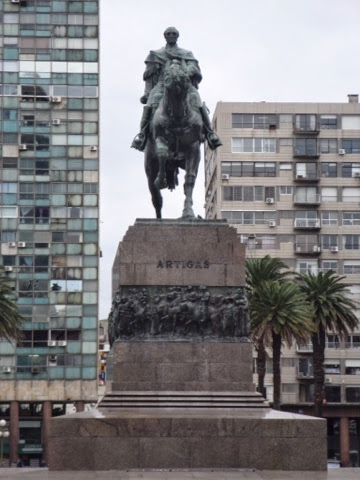 In the middle of the square is a large monument to Artigas, liberator of Uruguay. 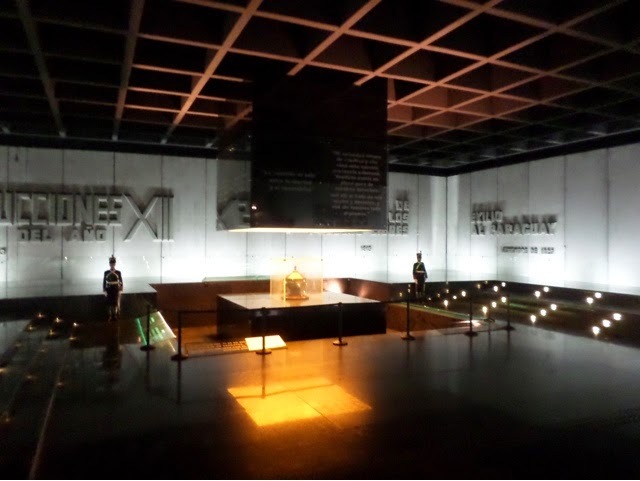 Underneath it is a large underground mausoleum, the Mausolea Artigas. I wonder how they built it, as I imagine that the mausoleum was constructed after the monument was erected, as it looks modern. Unfortunately the tour guide didn’t know and I haven’t had Wi-Fi to check it out. Geekily I was also interested to see the HQ of the ISO is located here, which I didn’t know. Inside the mausoleum. The guards are very still, I wonder if they move or talk to each other when no one else is down there? It must be a very dull job! At one end if the square is a large building that is paired with a Palace in Buenos Aires, which were both designed by the same architect. It’s pretty funky looking. The top sections hang out over the street, more so than you tell from this photo. The old Parliament House until 1983, a new building located directly to its right is now used as the Parliament House. The old city gate, it originally had walls extending out to either side that joined the surviving wall sections located down by the port. 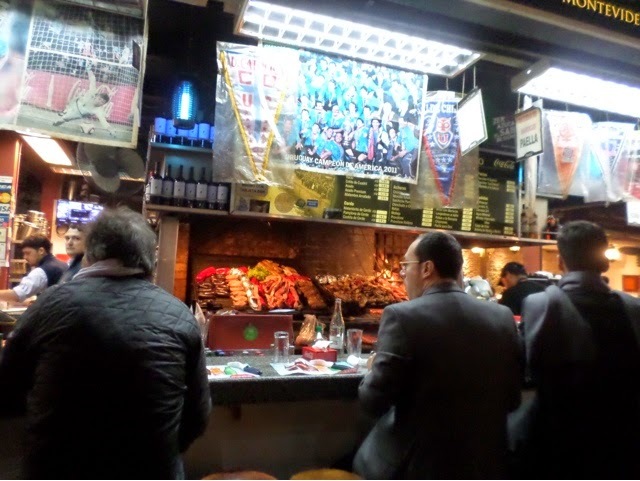 It was then onto the Mercade del Puerto for lunch. The market is pretty cool, it’s a covered market with craft stands and lots of BBQ restaurants where locals just pull up and sit at the counters. 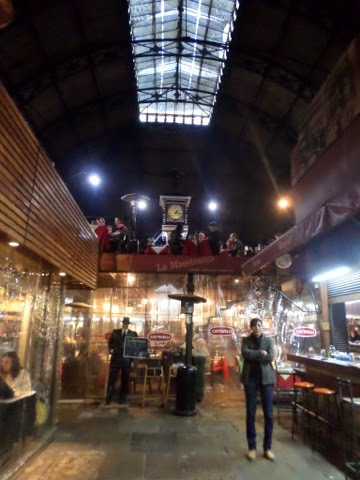 We ate in a terraced restaurant underneath a big clock. I had beef ribs, which were great but far too big and I ended up giving half of them away! We also got to try the local drink 50:50, which is combination of white wine and champagne. It’s nice, but very sweet, so it wouldn’t be my first choice. View up to the lunch spot. Lunch on the grill, with locals dropping by for their lunch. In the afternoon I went on the city bus tour. Unfortunately it almost immediately stated bucketing it down with rain, so I hardly saw anything! 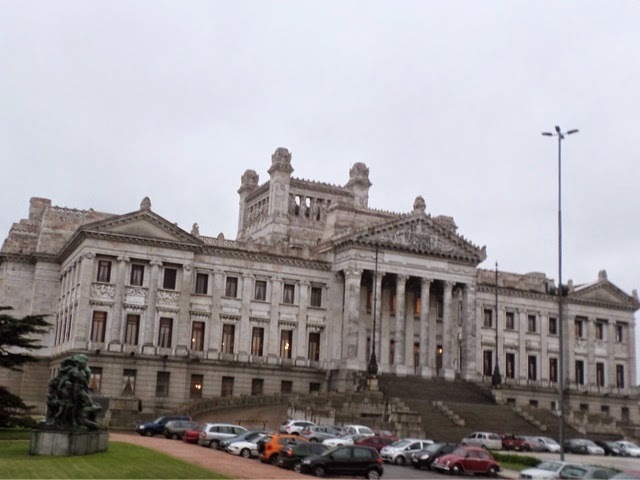 I did go past the Palacio Legislativo, which is very impressive. Driving through the suburbs Montevideo looks like it would be a beautiful city, on a sunnier day. The boys were all excited to see the football stadium. It hosted the first ever World Cup back in 1930, which Uruguay won. On the walk back I got absolutely soaking wet from the rain, so I decided to stay in for dinner and catch up on blogging and admin. Funnily I managed to snap the shower fitting off the wall! Although I think it had been broken before as it just came away in my hand and I won’t flatter myself in thinking I can break metal that easily :-). The following morning I had a bit of a lie-in before heading back to the bus station and off to go and stay on a traditional ranch, or estancia as they’re called here. It’s time get my hands dirty, exciting! 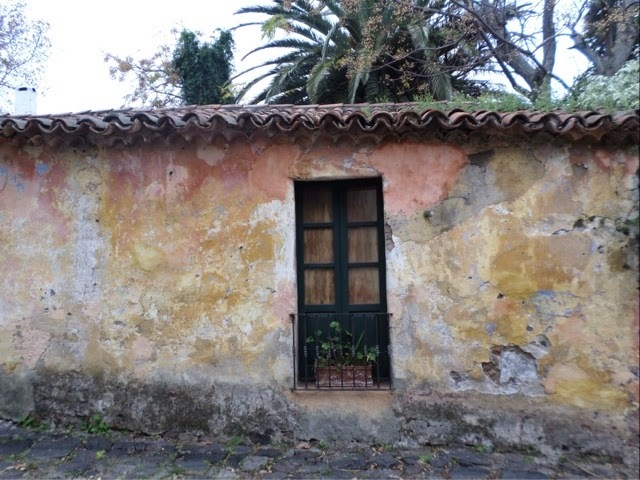 This entry was posted in Travel and tagged Artigas, Border, Calle de los Suspiros, Cathedral, Colonia, Intrepid, Mausolea Artigas, Mercade del Puerto, Montevideo, Palacio Legislativo, Rio de la Plata, South America, SouthAmericanAdventure, Travel, UNESCO, Uruguay. Bookmark the permalink.